Some people like to live every week like it’s Shark Week. But from now on I’m going to live every week like it’s Goliath Grouper Week. Yes, I know there’s no such thing as Goliath Grouper Week. But there should be. And I think you’ll agree after you watch the video below. It comes to us from the Everglade Fishing Company, a fishing charter based in Everglades City, Florida. During a recent outing with a family vacationing from Indiana, one of their clients was attempting to real in a 3-foot reef shark when a 500-pound goliath grouper swam up and gobbled the shark up like it was nothing. According to the Everglade Fishing Company’s Captain Jimmy Wheeler, he wrestled with the goliath grouper for a few minutes before the line loosened and the the fish spit the shark out. Prior to that they had planned to catch and release the shark. 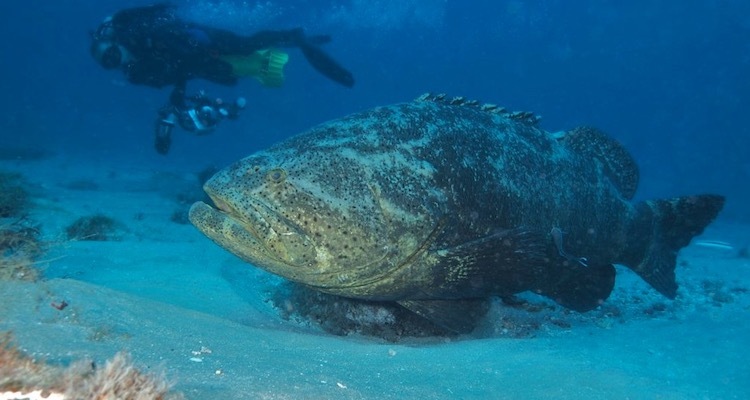 Goliath groupers have been protected in the state of Florida since 1990 due to declining populations. However, the species seems to have made a full recovery since then. Many fisherman now say goliath groupers have become a major nuisance because they go around eating up everything.